Your inner flower child will feel right at home when you put on one of these '60s Hippie and Go Go Costumes from Candy Apple Costumes. 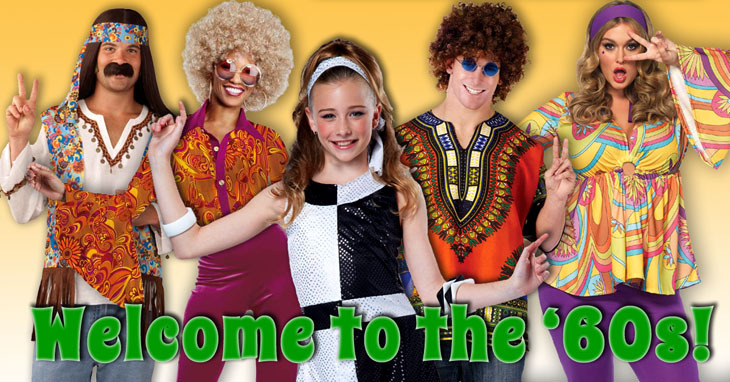 We have full ensembles, shoes, accessories, wigs and more so that you can create your ideal throwback costume for Halloween or a themed party. When you order through Candy Apple Costumes, you can rest assured that you'll be receiving a high-quality costume that you'll be able to wear year after year. Ladies love our '60s and '70s Women's costumes and all of the flower tunic shirts, bell bottoms, sequin jumpsuits and fringe vests that can be found in the category. Want to make it a matching couples' costume? No worries! We have a '60s and '70s Men's category that pairs perfectly with its female counterpart. If you're looking for a costume that's a bit more specific, then you'll be thrilled with our Jackie and JFK Costumes section complete with wigs, gloves and oversized sunglasses. Your whole friend group can go as the cast of one of the most popular television shows of the era by shopping our Gilligan's Island Costumes. If you already have the majority of your costume but still need a few accessories to really set it off, look no further than our '60s and '70s Accessories section featuring Round Lennon Sunglasses, White Knee High Go Go Boots, Peace Sign Necklace and Earrings and more. We hope you enjoy browsing our selection of Halloween costumes as much as we enjoyed sourcing all of these fun ensembles! Use our convenient sizing charts to compare your measurements and make sure you're ordering the perfect size to suit your frame. If you have any questions or want to place your order over the phone, give our helpful customer service team a call. In an early episode of the TV show Mad Men, someone said every woman in the 60's was either a Marilyn or a Jackie, a bombshell in a wiggle dress or a prim lady in white gloves and a circle skirt. There were also go go girls, teenage dance craze fanatics, hippies and beatniks. Alongside the lingering styles of the 50s were two fashion waves that rejected that feminine, full-skirted look - Mod and hippie. The Mod style - inspired by British Invasion stars like the Beatles, Twiggy and the new-to-the-big-screen character James Bond - favored fitted pedal pushers and ballet flats (think Audrey Hepburn), or mini skirts and short A-line go go dresses, color block patterns, false eyelashes, pale lipstick, go go boots, and short hair for women. Their male counterparts were either buttoned-down fellows in skinny ties, slim cut pants, and horn-rimmed glasses; Beatnik poets in round sunglasses and turtlenecks; or shaggy-haired boys trying to ride the wave of the British Invasion bands' popularity. On the other side of the dial was the hippie counter-culture, intentionally casual and relaxed to reflect their "peace and love" mantra. The flower children at Woodstock and on college campuses across the country wore bell bottom blue jeans, fringed vests, psychedelic prints, and love beads. They rejected the hairsprayed bouffant in favor of long, straight hair parted in the middle and adorned with braids, beads or feathers. Dressing up for a 60's or 70's party offers so many fun possibilities. See some ideas below inspired by the famous people and characters from music, movies and TV shows of the 60s!